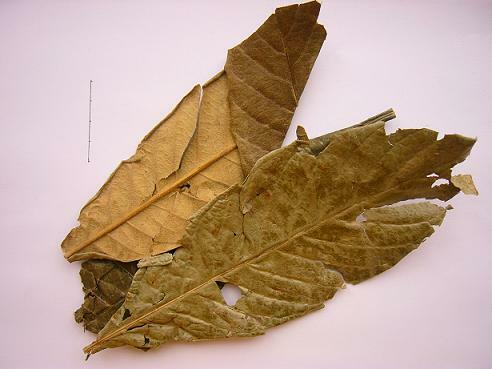 The dry leaf of Eriobotrya japonica (Thunb.) Lindl. of family Rosaceae. Light smell, slightly bitter taste. Large, grey green and intact. Dried in the sun, brushed the hair of the herb, cut into floss; unprocessed or stir-baked with honey. Bitter, slightly cold; lung and stomach meridians entered. Clear lung heat and resolve phlegm, stop cough and relieve dyspnea, clear stomach and stopping vomiting. It can clear lung heat, direct lung qi downward, resolve phlegm and stop dyspnea. 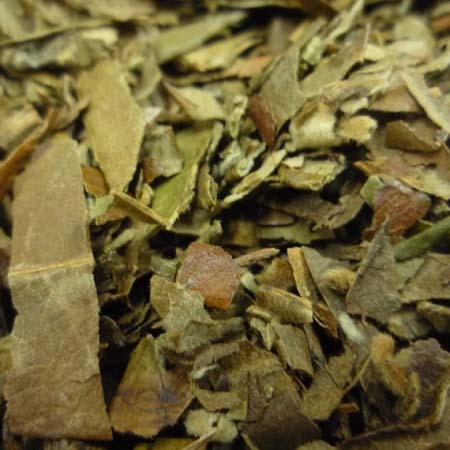 For lung heat cough with symptoms of yellow and stick phlegm, it is often combined with herbs to reinforce the action of clearing lung and resolving phlegm, such as Sang Bai Pi and Huang Qin and so on. For impairment of lung by dryness-heat manifested as cough with little phlegm or without phlegm, it is combined with Mai Dong, Sang Ye and Ku Xing Ren in Qing Zao Jiu Fei Tang from Yi Men Fa Lu. For chronic cough due to lung deficiency, it is often combined with qi-tonifying herbs and lung-moistening herbs. For instance, it is combined with Ren Shen, Bai He and Feng Mi and so on. It is indicated for vomiting and hiccup due to stomach heat with actions of clearing stomach heat and directing stomach qi downward. In order to obtain good actions, it is combined with Zhu Ru and Lu Gen and so on. For vomiting due to cold in middle energizer, it is combined with middle-warming and vomiting-arresting herbs to obtain the actions of warming the middle to dispel cold and harmonizing middle to arrest vomiting. For instance, it is combined with Sheng Jiang and Chen Pi, etc. In addition, it has actions of clearing stomach heat and quenching thirst, so it is indicated for thirsty due to heat diseases or diabetes. Decoct 3~10 g. Take double dose for fresh application. It should be wrapped during decoction to prevent throat itching caused by the floss. Stir-baked with honey for cough, processed for arresting vomiting.